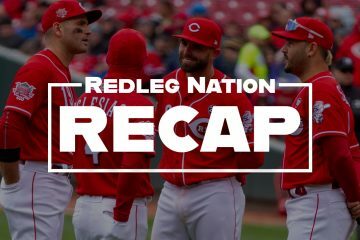 The Short Version: The Reds beat up on the St. Louis Cardinals, and that’s always a fun way to spend your Friday evening. –How can we describe tonight’s offense quickly? Let’s begin with Jesse Winker, who reached base in all four of his trips to the plate: 3 for 3 with a double, a walk, a run scored, and 3 RBI. Also…Jose Peraza: 3-5 with a run scored out of the leadoff spot. Eugenio Suarez had three doubles, and two runs scored. Dilson Herrera hit a three-run pinch-hit home run. Scooter Gennett homered, his 16th of the season. Scott Schebler and Adam Duvall each drove in runs. –Jared Hughes, Michael Lorenzen, Amir Garret, Austin Brice: four scoreless, hitless innings of relief. –Eugenio Suarez made a couple of really nice plays defensively. And Billy Hamilton robbed a home run in the bottom of the seventh (see tweets below for the video). Incredible play. Sheesh, I love both those guys. –Every time the Cardinals lose a baseball game, an angel gets his wings. –The Reds got on the board in the top of the first inning. Jose Peraza led off with a single, and Joey Votto walked one out later. With two outs, Jesse Winker doubled them both home. Jesse Winker is a good baseball player. –The ol’ Redlegs were up 3-1 as the game headed to the top of the seventh. With one out, Eugenio Suarez doubled and Winker singled him in. After a pitching change, Tucker Barnhart walked and Adam Duvall doubled in a run. 5-1, Reds. Dilson Herrera then blasted a pinch-hit 3-run homer to left, his first home run since 2015. Reds 8, Cardinals 1, and we were all having a lot of fun. –The Reds have three players with an OBP over .400 — Joey Votto, Eugenio Suarez, Jesse Winker — for the first time since Joe Morgan, Pete Rose, and Ken Griffey in 1976. –Rookie Jesse Winker is now hitting .295/.406/.434. He needs to: Play. Every. Single. Day. –Don’t look now, but Jose Peraza’s OBP is up to .326. He’s just 24, by the way. 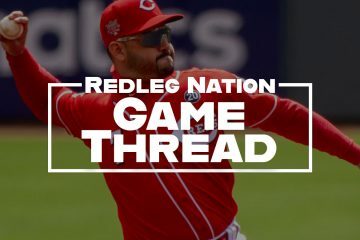 –The Reds should definitely sign Scooter Gennett to a contract extension. Or trade him. One or the other. –Harvey retired ten straight batters before walking the leadoff hitter in the sixth. And Jim Riggleman removed him from the game immediately. Harvey appeared to be stunned. Listen, I’m perfectly happy with the Reds being aware that most pitchers struggle the third time through an opponent’s lineup. Give Riggleman some credit for that. But this seemed a little extreme. But heck, it worked out, so what do I know? I hope everyone has noticed over the last month or so that Billy Hamilton is the best player on earth. Assuming that I mathed properly, Jesse Winker is hitting .350/.467/.569 with 27 walks and just 19 strikeouts over his last 40 games played (152 plate appearances). Too many good players is never a problem. What a fun game to watch!! I start to get excited and then remind myself that Homer is coming back and curl back up into the fetal position. Harvey is peaking at exactly the right time for the Reds. And yes, he’s got to be traded because no Boras client signs without testing the market. Hey, if the Reds really are going to spend more money next season, they can always bid on him in November. I think Riggleman took him out so quickly because his pitch count had hit 100, and there was no point in risking 1) injury by pushing a high pitch count that he has not yet hit; and 2) Harvey looking anything other than dominant to the scouts from other teams on hand watching him. Wow! ROY consideration is due for Jesse Winker. Fabulous catch by Hamilton. Hamil-non-runs. Very impressive 11 pitch AB for Herrera on his HR. Winker with a super night. Loved seeing the Cards fans exiting early in the 7th and 8th innings. One more W takes the series. Great all around win. Pitching, hitting and defense. Herrera looked like he actually knew what he was doing up there. Same the other night in Cleveland when he worked the walk to extend the game to Votto. Agreed. He appears to be a threat at the plate. Threat as in 106.5 mph EV on that laser line drive over the LF wall. I still don’t understand why Riggleman let Harvey hit for himself in the 6th if his leash was “allow any baserunner.” But whatever. My guess is Reds FO wants to maximize Harvey value as much as possible. 7 innings, 1 Run goes a long way to help that cause. Protecting his ERA and trade value by bringing in one of the best pen arms. When was the last time we saw Hughes in the 6th inning? Makes too much sense when you think about it. I think you’re right about not letting Harvey look bad. It was also a muggy night and I think he was at 93 pitches or something anyway. Man…I hate to see anyone on this team go right now. Harvey, Scooter, Billy, Iggy, Peraza, Dilson, Duvall, etc. It really seems like Harvey is having fun and the team is on the rise and playing well! Who runs the show the player or Scott Boras? If he said he’d like to explore staying then who makes the call? I don’t know what he wants or deserves, but it seems like they should atleast explore it? He seems to be about as good as Disco if not capable of getting past 5.2 or 6.1 or something? Thats no big deal in todays game though. Dilson looks like a legit hitter up there! I’d hate to lose him! They should give him a little time at 3B in the 2nd half & give Suarez a breather now and then. I also hate to lose Stephenson without giving him 1 more look. Its not like Castillo and Romano have been lights out. I agree…. Riggleman your killing me! Feel so strong about this I will post it again. Y not keep Scooter.If we hire a manager that has a clue. Whats wrong with having players with talent that basically play the same position.Look at the Cubs.Madden moves Zobrist,Happ,Bryant,Baez all over the field from game to game.It gives you a deep team when you do.None of those guys are stick outs defensively at any of the spots that they have been playing.Well maybe Baez. Totally agree. Don’t trade anybody just for the sake of the fans. The last time they did something because the fans wanted it , Bryan Price was hired. Trading Iggy would be not smart as well. Who in the bullpen can do his job? Garrett has been terrible the last 2 weeks and should have given up the homer tonight. I would trade him pronto. Depends on what someone gives for him. A top 50 (MLB wide) pitching prospect in AAA (See white in LA), might be worth it. The Reds are two mis-managed games against the Cubs away from being 6-1 with 7 games played in this touch 9 game stretch they are in. But the reality is they’ve won 4 so far, with 2 more to play. Realistically, most of us would have taken a 4-5 stretch given the competition, but these Reds could still yet go 6-3 or 5-4, finishing with a winning record. Just remember on June 9th, they were 22-43. Since then, they have only lost 9 games, and 3 of those losses came in extra innings. It needs to be said: This Reds team is legitimately GOOD. The offense is elite, and the pitching is adequate. If the pitching can move into the good/great category, this team could actually dominate ala the 2012 edition. But back to this season. If the Reds keep winning at their current clip, they should be able to get back to .500 on the season by the middle of August. And if they keep going from there, they could actually end up 5-10 games OVER .500. I’m not crazy enough to think the Reds can keep this up, but if they do, it’s not out of the realm of possibility that they could play themselves into Wild Card contention. What a wild season. It’s actually fun to be a Reds fan again. The two losses to the Cubs aren’t on Riggleman. Bad defense and a meltdown by e bull pen did them in. Other then his bunt fetish I like Riggleman. Well that and his lineups. Analytics say your best hitters should hit 2nd and 3rd. Tucker has no business being at the top of the lineup. I like his quick hook. He’s got a much better feel for pitching then Price. I’d rather have someone new school then old, but he’s done well overall! I don’t like his use of the bunt but I’m good with his line ups. He used Barnhsrdt at the top of the order then moved him down when Peraza got going a bit. The buttons he is pushing seem to be working. The team is playing well. He is a little to old school for me but the team is playing hard for him. Even his outfield rotation is working. All four guys are playing better and have had their moments. I hope the FO can come up with some starting pitching for next year. Other than the bunts, my only major issue with Riggleman is his usage of Winker. Not only should he be starting every day, but I don’t like how he’s pulled early in the 6th of 7th inning of every game he does start. The guy has an OBP over .400. Hopefully it serves as a wake up call to really work on improving his defense in the off-season. Seriously, have you really watched his play in the outfield? Don’t mean to be cruel, but he is ridiculously casual in his response. Like he’s smoking pot out there…not that there’s anything wrong with that. His response is noticeably delayed, he is unclear what to do with the ball once he gets it, and his arm is pathetic. I hear you all when you talk of the wonders of his mighty bat, but somehow we’ve got to get him on the program on the defensive side of the ball. Defense DOES MATTER. The Reds are lessened in the field when he supplants Schebler in right. When he bumps Duvall and plays left, we take a bigger hit still. And when Hamilton is out, Schebler takes center and Winker goes to right, we are much diminished at two outfield positions. I LOVE Winker as a hitter, but he REALLY has to get with the program and pick up on technique and strategy in the OF. Any win against the Cards is a great win. This team continues to roll. This game was just pure fun to watch. The Herrera dinger and the catch by Billy added exclamation points to Winker and Suarez tonight. Love me some roasted Dirty Birds!!! Those are 5 starters, every game, every pitching matchup, every venue for the rest of the season…no exceptions and no excuses…and NO BUNTING!!! No rest for those guys, either, Cossack? BC is still driving the bus. Any and all decisions regarding baseball operations go through CEO BC and WJ is the Execuitive (and only) Advisor to BC. Everyone else in baseball operations is simply a title and figurehead, taking care of the routine details of daily tasks. I hate the Cubbies, Pirates, and Brewers(although I find it a little harder to hate the BrewCrew). I hate the Dirty Birds more than all of them combined. I would change Pirates and Dodgers in that list. I hate the Dodgers and Yanks each more then the rest combined. Of course, by hate for LA comes from the Mid-70’s teams. I must be getting too old because I don’t particularly despise the Dodgers any more. In fact, in some crazy twist of nostalgia, I nearly bought a Dodger hat when I was in LA recently. We were passing through Union Station LA around noon on a Sunday. It was neat to see families on their way to the Dodger game coming into to the station on the various commuter trains and boarding the “Dodger Express” shuttle buses to the Stadium. It reminded me of the olden days at Crosley Field when shuttles used to deliver fans from all points in the city and outreaches to the Reds game. My eldest grand-daughter, visiting from California, wore a Dodgers hat at the lake. Fortunately, my youngest daughter was wearing my Reds hat, thus preventing an ugly scene. BC certainly has the last word. That’s why us fans should not be surprised when the manager is named going forward. It also appears to me that Dilson Herrera is a worthy successor to Brandon Phillips at second base. Let’s give him more than 2 at bats before we name him the starter. Glove wise he couldn’t hold Brandon’s jock. You never wore a cup playing baseball? Most players do except maybe outfielders. JACK: Only 2 more at bats before you name Herrera the starter and downgrade his defensive skills? You have to admit, he’s had two brilliant at-bats in run-producing situations. The at-bat Friday night was fantastic, though not in as high-pressure of a situation as the one in Cleveland. The guy looks like a professional hitter, and that was supposedly his strength. He needs to play…regularly (as in starting every game) to find out what he can do at the MLB level. Without the injury and proper due diligence at the time of the trade, he was a top prospect and a viable return in the Bruce trade. I know the Mets fans were aghast and rioting at the time the trade was announced. Of course that’s S.O.P. for New Yorkers. If we had the foresight two years ago to see where Jay Bruce is now on the productivity scale compared to where Herrera is on the potential productivity scale, we would have said at the time that that was a good trade. I certainly believe that now. Herrara wasn’t even the guy the Reds were suppose to get for Bruce. The original guy was Nimmo. But he was damaged goods. So they threw in Herrara instead who was damaged goods as well. Obviously the front office got lucky in the trade. Herrera needs to play every day to see if Senzel needs to move to another position. Let’s just not hand the job to Herrera over 6 at bats. Seems like we have done this before with a guy in centerfield and we are still complaining about him 5 years later. Let’s give him him a contract extension as well because of 2 brilliant at bats! It’s amazing you all nit pick everything Peraza does but 2 brilliant at bats and Herrera is the savior. They say you need about 1500 at bats before they can gauge what type of player he will be. Not 6. Not saying anything about a contract extension for Herrera. He appears to be a really good hitter who has been added to the major league roster. Good news for the big league team. We may be complaining about him, but the pitchers aren’t. Or, for that matter, Votto and Barnhardt. Excellent catch by Billy H. last night. Especially while on the road. Hamilton is hitting .337/ .391 in the Reds last 30 games. He’s only struck out 13 times in his last 83 AB. He has stolen 12 bases during that period & only been caught once. His value is peaking. Make a trade. We all know his current production will wane again. Great win. Always a good thing to beat the Cards. I do however get befuddled at all the “Keep Harvey and Sign him” talk. Regardless of how we fans feel, baseball players are playing for money and Harvey and Boras are not going to sign with the Reds without seeing what they can get on open market. They would be crazy not to explore that and each good start that Harvey makes the chances grow less and less he will be around. I think the same is true for Gennett. I am afraid that BC and WJ are going to sign him for more than the Reds can afford because they like his grit. (Remember Skip) and we are going to end up with another BP situation all the while wasting the years of Herrera and Senzel. BC has imput. That surprises people? He owns the club. Actually he has them on the verge of being a very good club. Talented minor league system, pretty good everyday line up. If he opens up his wallet and finds some productive pieces for the rotation he could contend for a championship. Quite a accomplishment for a small market club. Under his leadership we were a missed groundball by Rolen from playing in the series. We also had a 3-1 lead in that series. Many worse ownerships out there then this one. This team has some good talent. Let’s see if he can finish the job before passing judgement. Good Owners hire good managers and let them do their jobs. They adjust to changing economics and are open to new ideas. They don’t fixate on players because they are personal or fan favorites. Right now, I’d say none of that applies to Uncle Bob. On the other hand and despite our certainty that it was a ill-conceived failure, the rebuild is starting to look as though it has resulted in a competitive team. Maybe we don’t know as much as we think we do. And let’s not forget the Hannigan passed ball which positioned the runner to score on Rolen’s misplay. Two of the most unlikely turn of events each on its own which somehow came back to back at the worst of times. Murphy’s law personified. Every time the Cardinals lose a baseball game, an angel gets his wings. You should read the Cards message boards/Twitter comments. Many expressing their displeasure with Matheny and wanting him fired now. Always good to catch a team when they’re trending down. Per Reds: another pleasure in watching Harvey pitch. He’s so good. Pounds that strike zone. Hate to see him go. I know we can’t keep him but I wish we’d try. You can see the ace in him. If the Reds don’t want and appreciate what Winker can do, they will find plenty of teams willing to take him off their hands, warts and all. Somewhat missed among Herrera’s homer and Hamilton’s catch was a pretty darn good AB by Duvall ahead of Herrera. He was also down 0-2, ran the count full and doubled on the 8th pitch of the AB to score Winker. Just seems like everybody is doing whatever it takes to keep the train moving down the tracks. I know this lineup is just due to the designated spot in the OF rotation, but this lineup looks really good, with Tucker getting a day game after a night game off. ItÃ¢â‚¬â„¢s going to be a hot time in the old ballpark this afternoon. Flaherty represents another tough starter who pounds the strike zone. Hopefully the Reds can get through to the Dirty Birds bullpen early. Is the outfield rotation over? Duvall out of the lineup. Casali gets a start….95+ degrees in St Louis . Good move. Let Tucker recover and get ready for another scorcher tomorrow. The Cards are only 2 over .500 and per Ctrent retweet have a 14% chance of making playoffs. Might as well have Castillo throw a gem and the offense drop a 7 spot and really frustrate the Redbirds over that LONG All star break. Nope, it is just Duvall’s turn in the OF rotation for him to sit. Winker is known for his plate disciple abd on base skills , but he’s a hitter first. I actually liked him hitting 5 after scooter/votto/suarez last night. That’s 4 tough hitters in a row. This offense is legit. Looks like scooter is staying. Throw in Senzel at CF and leadoff? As long as Billy and Peraza stay at or over league average in getting on base we stay really good on offense but we will continue to struggle at home in trying to keep up with the home runs the other teams hit.Honestly the difference has been the pitching and its because we now have two veteran pitchers anchoring the rotation in Harvey and Disco.The young guys have had their moments both good and bad but their is nothing like learning to pitch at the big league level.I really hoped Bob would take Harvey’s spot because in my opinion he has swing and miss stuff which plays big time in the majors. I don’t think we’ll see Stephenson in a Reds uni again. I can see him getting dealt in a package by the deadline. Stephenson’s refusal to cut down on his walks is not sitting well with Red’s management and I won’t be surprised if they move him. I think he has cut down on his walks lately, hasn’t he? Somebody will be glad to pick him up and give him a shot.His walks are his lone negative.His ERA is a half a run better then average in the league,he has fanned 109 in 86 innings and has given up only 64 hits.Its more then the walks.